Director Sarah Gavron and screenwriter Abi Morgan first collaborated on Brick Lane (2007), an adaptation of Monica Ali’s novel about a young Bangladeshi woman dealing with the constraints of an arranged marriage in contemporary London. The pair are partnering again for another story set in London, but this one set 100 years back. With Suffragette, Gavron and Morgan explore Britain’s early women’s rights movement and the struggle to gain the right to vote through the eyes of Maud Watts (Carey Mulligan), a laundress, married with a young son. 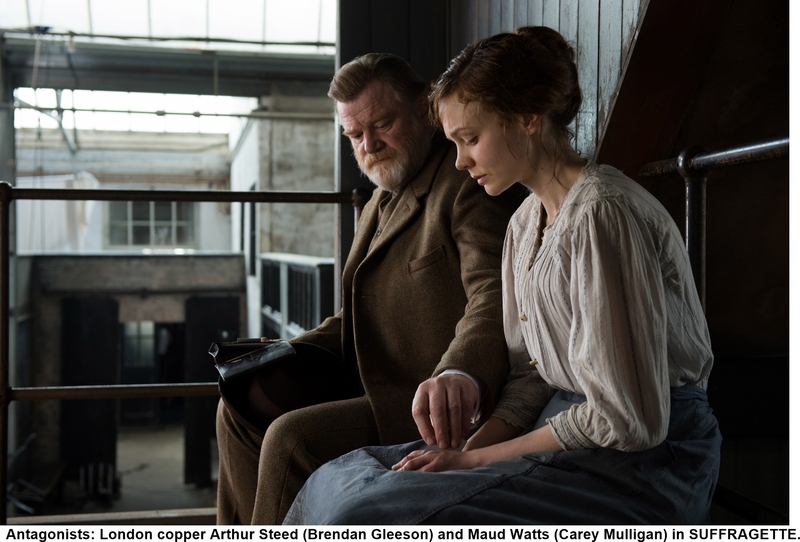 A sterling supporting cast that includes Helena Bonham Carter, Anne-Marie Duff, Natalie Press, Meryl Streep, Romola Garai, Ben Whishaw, and Brendan Gleeson, supports Mulligan, but the focus is never long off Maud as she evolves from a young woman shocked at witnessing acts of civil disobedience to one willing to risk jail and worse for the cause. In the San Francisco Bay Area recently to attend the Mill Valley Film Festival where Suffragette was the closing-night film, Gavron and Morgan sat down to talk about how the story evolved and how an early 20th century laundress’ story might resonate with women today. Q: Where did this start? Was it an ongoing interest in women’s rights, was it inspired by a particular person, or …? Sarah Gavron: It was kind of a long genesis for me, because I wanted to do it for about 10 years. I grew up with a mother who became a local politician and I’d watched her agency in a very male world. We hadn’t learned about the suffragettes in school. We just learned this very sanitized version. We knew the Mary Poppins version, like everybody did. It’s not a widely known story. People began talking about it. There was a really good TV series called Shoulder to Shoulder that made an impact. People were always discussing it, but there hadn’t been a big screen version of it. It seemed extraordinary and such a timely story and overdue in telling such a story, but it also seemed to resonate with the world that we’re in in so many ways. The two producers, Faye Ward and Alison Owen, it occurred to them around the same time, so they had a conversation, ‘How about doing a thing about this?’ It so made sense to us to talk to Abi, because she’d worked with us on Brick Lane and we had such a good collaboration. Abi Morgan: I think from my point of view, it was just very exciting. I’d done biopics before, but this felt like a different way of looking at a biopic and, in a weird way, when we started to focus in and think, ‘OK, we could do the extraordinary life of Mrs. Pankhurst or Emily Wilding Davidson, but those women will at one point have a film about their lives.’ I hope they do, but actually when we started looking at the lives of the working women and honed in on those, there was just surprising detail wherever we looked: through the police surveillance records, which were only opened in 2003, where you’d see a tiny bit of an interview or you would read the testimonial of a woman that had been taken when she took the deputation to the House of Parliament or just a tiny news article. You’d suddenly think, ‘Gosh, these women are really interesting.’ The jeopardy on their lives and what the vote would mean for them was so profound. So many of these women were being appallingly treated at work. Their working conditions were just chronic. They were trying to manage having working lives and children. They didn’t have wealthy husbands or family wealth. They were fighting for equal pay. They were dealing with sexual violence at work and at home. So many of these issues that they were dealing with felt so profound and so 21st century. I think that’s when we started to think, ‘OK, so what would it be like if we took a woman who was outside of that, in a place of passivity, who didn’t realize just how downtrodden and difficult her life was and then through engagement with the movement, moves towards militant activism and change?’ We realized it was the ordinary women that change history. Then we thought, ‘That might be a story for us all.’ So I think that’s when we started to feel like this could be a proper movie. Q: How important was it that the protagonist be kind of the whole package, be married, be a mother, be someone who has, up to the point, essentially accepted her lot in life and only gradually comes to see that it doesn’t have to be her lot in life? Abi Morgan: I think those are strains that feel very familiar to us all. We were trying to create a character who was identifiable. I don’t think you have to have been a woman who was married. I think the point of the film is it’s about empowering women, say, in Britain in the 21st century—globally, we know there are these huge inequalities that we deal with. I think for Maud we wanted to create a woman who was not even yet engaged with how unhappy she was. This is a young woman who was institutionalized from an early age. She’s been abused by her employer. Her mother was most likely abused before her. The character of Maud has a scar on her arm. The nominal idea was she was there when her mother was burned at the laundry. You’re meant to realize this woman has a huge legacy that she has just suppressed and suppressed. An engagement with the movement, an engagement with a group of woman who say, ‘We are equal, you no longer have to deal with these conditions, your life can change,’ is the thing that activates her. It was very important to create all those pressures that women today have. They have to bring in money. They have to raise their children. They have to deal with sexual violence or sexual intimidation. They have to find their voice, and the whole point of the film is give these voiceless woman a voice. Sarah Gavron: And by looking at a marriage in the center of it, we were able to look at the politics of marriage in terms of the power balances and the parental rights issues and the lack of economic power within a marriage. I’m sure at the time there were many more women married because it was the convention of the day. Q: It also raises the stakes so much higher. Abi Morgan: That’s a good point. The film couldn’t work as just a political tract. It had to work as a piece of genuine human drama. We were trying concretize that jeopardy. That’s something Sarah worked really hard on. Sarah Gavron: It connects with these people and their lives.